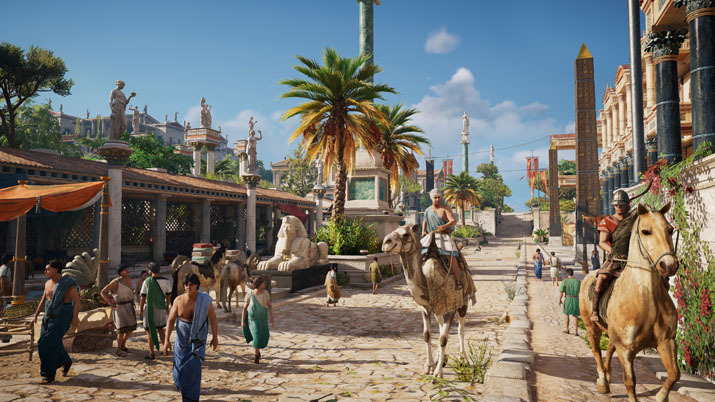 As you explore Egypt, a nation yet to be visited by the franchise, you embark on an original quest, learn the history of the assassin’s brotherhood, and level up your character, Bayek. Assassin’s Creed: Origins is an action-combat RPG sporting the classic parkour elements of the series. The newly incorporated RPG elements add a different dimension to the Assassin’s Creed legacy: you don’t have to spend skill points to level up like you did in Assassin’s Creed: Syndicate. Instead, you gain experience from various activities, and after you level up, you receive ability points, which you can spend on a skill tree to further develop your character. The skill tree lets you refine the RPG elements of Bayek. There are three trees, or pathways, from which to choose: Hunter, Warrior, and Seer. You can spend all your ability points in one tree, or spread them between a mixture of the three. Some of the abilities connect to different trees, which makes choosing a mixture of abilities from the three trees easier and more customizable. This also adds a level of replayability that Assassin’s Creed titles haven’t seen before because you could have a completely different playthrough of Origins each time. The Hunter tree is your basic archer ability tree, and it allows you to specialize in ranged weapons to snipe your targets from afar. In contrast, the Warrior tree specializes in melee combat, enabling you to overpower your enemies, armored and larger enemies be damned. Seer, despite its mystical sounding name, is the rogue ability tree. It specializes in using tools to assist you in elusive combat tactics and gives you more means to employ the element of surprise to bewilder, poison, corrode flesh off of, roast alive, or put to sleep enemies, among many other types of skullduggery. However, there are several abilities in each tree that are beneficial for all situations, such as the Seer being able to tame animals to assist in combat, or the warrior giving you more powerful punches. As you examine the three different ability trees, make sure to read all the possibilities so that you can plan the pathway you want to take and how best to supplement your RPG gameplay. Origins also introduces crafting as a major part of gameplay; in fact, ignoring the crafting system is not possible. While you can find some weapons and armor as part of the looting system, the best upgrades come through crafting. Sometimes, you need to collect the materials and a blacksmith will upgrade or build armor or weapons for you. Other times, by gathering the materials, your armor is then upgradable from the inventory menu, without the need to visit a craftsman. Crafting is made easier with Senu, your eagle pet that you control. Senu can find animals that provide the necessary leather and materials. In addition to the animus pulse ability, Senu replaces the Eagle Vision ability from other Assassin’s Creed titles. You can fly as Senu and identify crafting materials, enemies, and other mechanics and track them. Flying as Senu, though, can be difficult. Senu’s flight mechanics aren’t always intuitive, so be sure to play around with the controls the first time you take wing. This allows you to acclimate to flying, tracking, hovering, and steering. Senu also increases your ability to strategically plan out your assaults. In previous Assassin’s Creed titles, knowing that your enemy is in a certain area meant that each strategy consisted of sneaking or barreling into a fray and hoping that by killing enough guards you would eventually run into your primary target and quest objective. Using Senu in Origins allows you to spy on your opponents and tag them, giving you insights on where they are and perceiving their actions that might make them vulnerable, such as eating, sleeping, and praying (weapons not in hand). 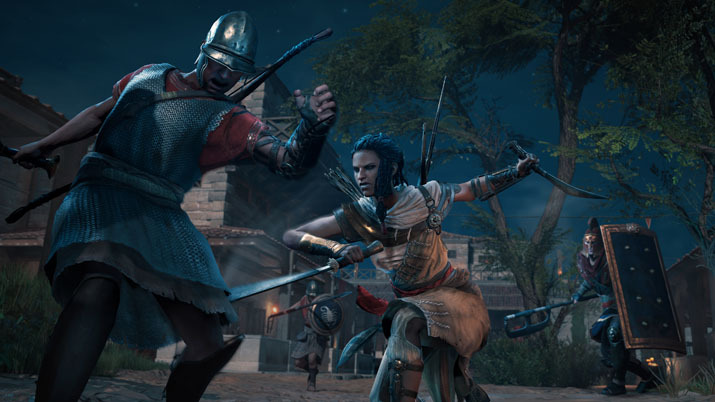 While you can still grind through the levels and attempt to bash your head against the difficulty level until producing the desired results, the alternative option for true assassin players is to use Senu to her full capacity, still enabling you to skillfully execute a minimal amount of targets as possible. This also enhances the enemy tracking ability mechanic of the gameplay. If you, as a player, have encountered, or “seen,” an enemy, you are able to track their movements through walls, see their stages of confrontation against you, and see their level to help you determine their threat to you. That said, if you have not seen an enemy, or not properly surveyed the area with Senu, there will be plenty of guards around corners that will turn your expert stealth operation into a bumbling scramble for your melee weapons of choice. Ubisoft has unfolded world exploration in Assassin’s Creed to include expansive underwater exploration. In previous Assassin’s Creed titles, you could swim, but you could never dive beneath the water surface. In Origins, you can dive down, loot jars and chests, and explore sunken ships. Perils are concomitant with the nautical environment, as Origins includes various species of wild aquatic fauna, such as hippopotami and crocodiles that may very well see you as their next meal ticket. In addition to underwater exploration, Origins includes mounted combat. The mounted combat aspires to be something awesome, as you can fight on camels and horses — a unicorn, too, if you’re willing to spring the Helix credits to unlock it. However, the mounted combat falls short of expectations. When you use mounted combat, you expect to have at least a tactical advantage. For the first several hours of gameplay, mounted combat in Origins seems flat or like a four-legged handicap. Controlling your mount is difficult, and some of the mounts’ turning abilities are rather wide. This gives enemies, especially higher level ones or groups of hyenas, opportunities of attack as you hack-and-slash your weapon around. Your ability to call your mount to you makes for great transportation, but as soon as you mount, you can expect all of your enemies to be able to ‘summon’ their mounts as well. Old-fashioned movies are more accurate, with the protagonist scaring away all the guards’ horses before trying to escape on the only remaining steed. The third person perspective, while standard in Assassin’s Creed titles, limits your control over your mounts, which makes mounted combat feel weak; if you had the option of playing in first person while on the mount, this might improve mounted combat control. Unless you eat, sleep, and drink Assassin’s Creed, which I was tempted to do with Origins, you will have a difficulty remembering what the different buttons and controls are, especially if you play on a PC. Plan to spend a lot of initial gaming time rereading the control menu, which isn’t easy to find, until you are more comfortable and can start remembering some of the controls. If you take any break from the game, expect to have to spend a lot of time refreshing yourself in the control menu. Origins still struggles with one of its primary gameplay hurdles. Personally, I love Assassin’s Creed. Being able to jump and climb around like a parkour boss is really pleasurable, especially if you get to kill people while doing it. I can live out my jumping dreams without actually needing to have the strength to climb crazy walls or buildings and dangle there for long minutes as you figure out the best path to take. But, because Ubisoft doesn’t want you to die all the time as you climb up or down complicated surfaces, they help you out through an auto-pathing. This extra help can be too helpful at times, though. And, while it has gotten better from the original Assassin Creed titles, the auto-pathing still restricts you from performing actions you can do in other titles, such as jumping 360 degrees. If the auto-pathing is keeping your character from falling off an edge, forget spinning quickly to kill or block an enemy. And you’ll never turn a full 360 degrees mid-jump for fast attacks, either. It just doesn’t happen. Think this is annoying? Try getting your mount unstuck with this problem. I spent five minutes trying to get my horse to leap over a 2-foot ledge onto a flat at level surface only to be trapped within a wall that couldn't keep out a toddler. I can still remember to this day the first four hours I spent playing the first Assassin's Creed back in 2009. 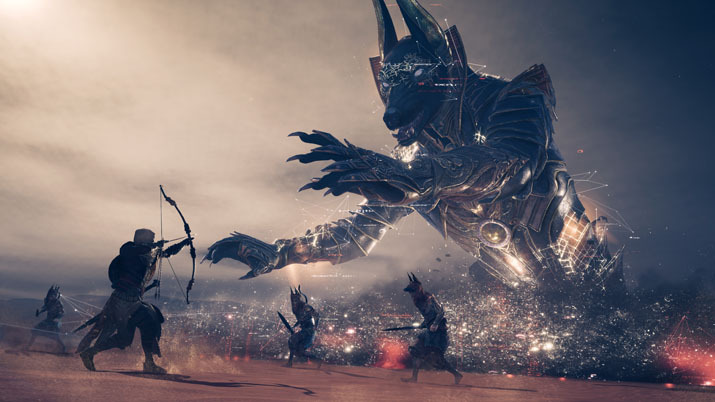 The exhilaration of ruthlessly annihilating both innocents and deserving made the Assassin’s Creed titles an unforgettable and enjoyable experience, and Origins continues as it expounds and abounds with hours of rich gameplay. If you like assassinating people with primitive weapons, Origins is for you.